We're welcoming back one of our favorite eyeshadows. It's been one of our most popular colors in the past and I am so happy to share it with you again. 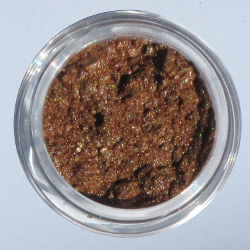 Wealth Eyeshadow- This beautiful coppery tone has flecks of gold and bronze and will make green eyes and brown eyes alike pop. The sparkle is moderate and it applies in a satiny-sheen wash of opaque color.